Located on Florida International University’s (FIU) Biscayne Bay Campus, the Batchelor Environmental Center (BEC) is a 1.48-acre plot located along the Oleta River. The museum’s most crucial animal-focused and environmental restoration work is done through the Batchelor Environmental Center. The center has operations currently spread among several facilities, including the Phillip and Patricia Frost Museum of Science, Batchelor Wildlife Center in Coconut Grove and Batchelor Environmental Center at FIU. Opening in 2018, the Batchelor Environmental Center at FIU will be a 75,000-square-foot facility located at Florida International University’s Biscayne Bay Campus in North Miami. Once completed, it will be an aquatic and avian care and research facility in partnership with FIU, housing the continued operations of the aquatic animal quarantine for the museum, the Batchelor Bird of Prey Rehabilitation Center, as well as a key location for the center’s MUVE coastal restoration program. In addition, it will have a classroom, veterinary clinic and support space for student and faculty research and informal environmental science classes. The Batchelor Environmental Center at FIU allows us to have a leading-edge aquatic quarantine and holding center for the museum. The 150,000-gallon aquarium system divides into several vessels, some for sharks and pelagic fish, others for reef fish, and others for sea turtle rescue. This section of the building will also house our coral culture system, where we grow corals for our exhibits. The raptor rehab area at the Batchelor Environmental Center at FIU will upgrade our ability to help these beautiful animals. Notable assets include “positive” airflow to maintain an ultra-hygienic environment for the birds, special ICU cages, a comprehensive animal pharmacy and cutting-edge X-ray equipment sensitive enough to read soft tissue and delicate bird bones. The new space will also improve the staff’s ability to conduct physical rehab, including using play objects such as snake skins and pumpkins, range-of-motion work, and eventually flight testing, so we can release the birds back into the wild. 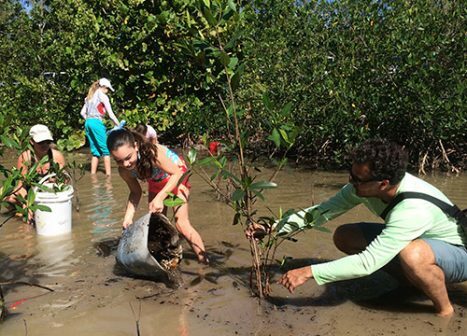 MUVE, which organizes citizens to get out, get their hands dirty, and restore coastal habitats, is working to improve the natural habitats around south Florida. Key initiative areas include Virginia Key and Oleta River State Park. MUVE engages volunteers to participate in removing invasive plants and planting native vegetation such as mangrove and hardwood hammock species. Museum Volunteers for the Environment, or MUVE, is the Phillip and Patricia Frost Science Museum's volunteer-led coastal habitat restoration and monitoring project. 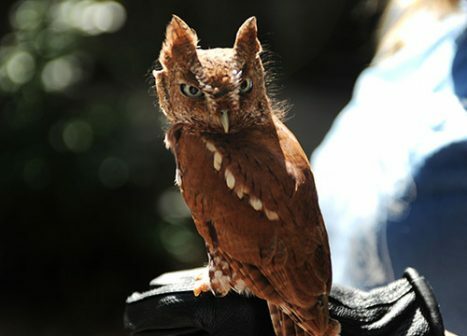 The Falcon Batchelor Raptor Rehabilitation Center is dedicated to the rehabilitation and release of injured birds, and specializes in native and migratory raptors of Florida.